The Stiebel Eltron DHC-E series tankless water heaters are the most advanced point-of-use tankless water heaters on the market today. The DHC-E 8, DHC-E 8/10, and DHC-E 12 all feature the same industry-leading thermostatic temperature control and flow and temperature based power modulation technology found in Stiebel Eltron's flagship Tempra whole house heaters. Set the desired temperature on the front of the unit and enjoy water temperatures between 86° (30°C), and 125° (52°C) for the DHC-E 8 or between 86° (30°C), and 140° (60°C) for the DHC-E 8/10 or DHC-E 12. Change the desired temperature at anytime. Advanced microprocessor technology ensures that the water temperature never deviates from the set point. 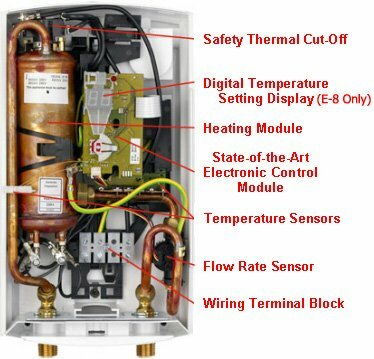 By producing hot water on demand only as it is being used, DHC-E Series tankless water heaters are extremely energy efficient. A sophisticated water flow sensor recognizes when hot water is being used and when it has been turned off, so the unit will activate and deactivate automatically so it only runs when you are actually using water. This eliminates standby thermal heat losses associated with traditional tank type water heaters. Accordingly, you can expect to see a significant cost reduction over the operating cost of a conventional water heater. brochure for temp rise chart based on 208v input. True Thermostatic Temperature Control and Flow-Based Power Modulation! DHC-E Series point-of-use tankless water heaters are ideal for bathroom sinks, kitchens, commercial washrooms, and a wide range of other point of use applications. Due to their small size, they conveniently fit directly under the sink or adjacent cupboard or closet, so they deliver hot water to the sink almost instantly. By locating the heater right near the point-of-use, you can also eliminate thermal heat loss commonly associated with long pipe runs. In new construction applications, you also eliminate the need to run a hot water line all the way from the main central water heater which can save you significant money in plumbing and material cost. 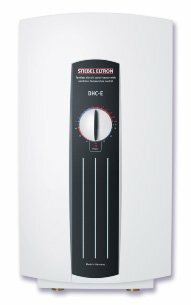 Stiebel Eltron DHC-E Series heaters are not recommended for whole house use. For more information on whole house models, see our Stiebel Eltron Tempra Series Whole House Tankless Water Heaters. flow rate and incoming water temperature. * Breaker size and wire gauge must meet all applicable local, state, provincial, and national electrical codes for your area - these are only guidelines that will apply to most installations. Please consult your electrician for more details. Copyright 1999 to 2019 All Rights Reserved. "Go Tankless" and its associated logo are registered trademarks.